At VOCAL, our comprehensive experience in digital signal processing and the implementation and configuration of echo cancellation solutions will provide you the best design for your product development. Many open source solutions are also available. But oftentimes, it is discovered late in the development cycle that the selected echo cancellation component does not produce the desired audio quality. Development teams are then left fumbling around trying to tune a limited set of digital signal processing parameters to get barely acceptable audio. VOCAL’s in-house echo cancellation solutions allow for quick integration and custom configuration to meet your audio quality requirements. Our expert engineers make the necessary adjustments to provide you with a digital signal processing solution that is tailored to your product and delivers superior voice quality that exceeds the ITU standards. Please contact us to discuss your echo cancellation application requirements. One of the first tests we perform is our noise burst test. A white noise signal is generated to be played from the loudspeaker, which is echoed through the system and the microphone signal is recorded. By observing both signals, the frequency response of the echo path can be determined. This allows us to identify any frequency that has a gain in the echo path, which must be avoided at all cost, since the returning echo signal will be saturated and non-linear. The majority of the time this is caused by inappropriate hardware gain settings, but sometimes the form factor of the product can result in strong acoustic coupling at certain frequencies. Instead of doing a redesign, our engineers can quickly create a custom software solution so the effects on the non-linearities are minimized and high quality echo cancellation results. For example, in a full-duplex home automation intercom system, the near-end speaker will most likely be located a considerable distance from the loudspeaker and microphone. For the near-end speaker to be heard and speech to be captured clearly, the gain on both the loudspeaker and microphone will be set high. Unfortunately this creates a particularly harsh echo environment, where the acoustic coupling will be strong and nonlinear echoes present. The main challenge for the system designer is to handle the near- to far-end speaker ratio (NFR). The NFR will be much less than 0dB and during double-talk (both near- and far-end speakers talk simultaneously), the echo signal will swamp the near-end signal. For this application double-talk detectors can be extremely unreliable; fortunately the divergence caused by the near-end speaker will not be as severe, but still will produce unpleasant results. 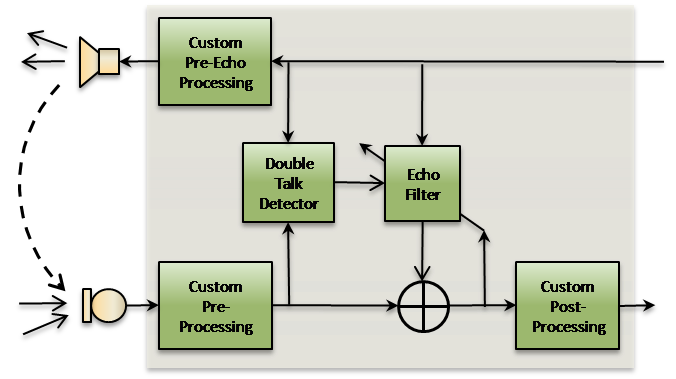 Since the echo path is constantly changing and the accuracy of a double talk detection algorithm cannot be guaranteed, VOCAL has implemented a two-path echo canceller, a simple but very effective way to improve the digital signal processing system performance for handling doubletalk and echo path changes. VOCAL’s software is available for the following platforms. Our source code is optimized for DSPs and conventional processors from TI, ADI, Intel, ARM and other vendors. Please contact us for your specific Echo Cancellation application platforms.